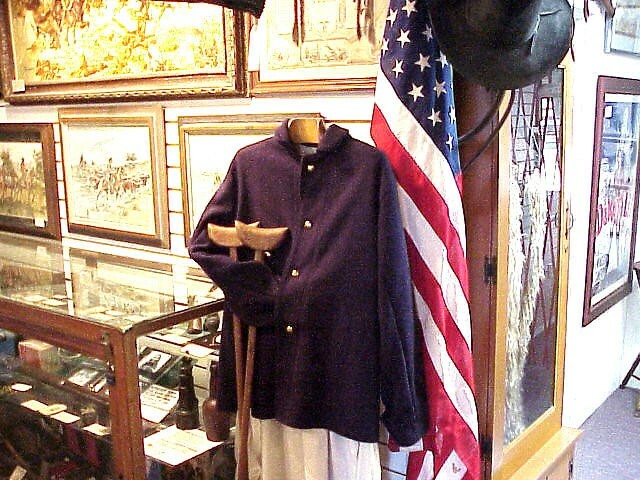 This Civil War Union Uniform is 100% Wool. Fully lined Jacket probably around size 42, pants (size 38 waist) Large linen shirt. All items are marked Warner Bros Wardrobe Dept and came out of Warner Bros Auction after Dances with Wolves Movie was released. The pants are uncut so length of pants can be adjusted to any size. Great for re-enactment. This Civil War Union Uniform is 100% Wool. Fully lined Jacket probably around size 42, pants (size 38 waist) Large linen shirt. All items are marked Warner Bros Wardrobe Dept and came out of Warner Bros Auction after Dances with Wolves Movie was released. The pants long and are uncut so length of pants can be adjusted to any size. Great for re-enactment. Please email cowboyron@cowboycabin.com with questions or call 406 270-2842.